Only needs to be proved once. 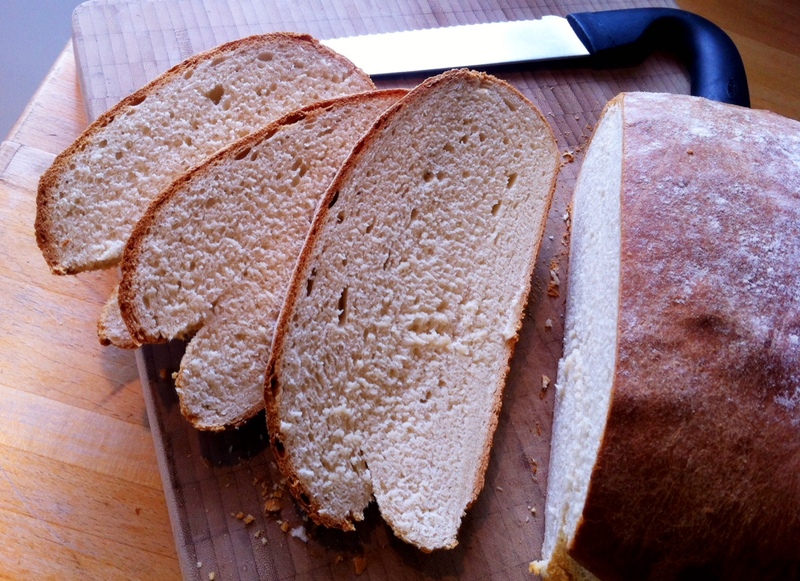 Easy to make milk bread. Preheat your oven to 200 – 220 degrees (Celsius). Start by rubbing the butter and salt into the flour until it resembles fine breadcrumbs. Add sugar and dried yeast and mix well. Combine the milk and water and heat either in the microwave or in a saucepan. Pour this into your flour mixture and use a wooden spoon to mix well. This creates a very sticky batter but it will come away from the bowl after a well. Turn the dough out onto a well floured table and start kneading. You’ll need to keep re-flouring the surface because of the stickiness of this dough but keep kneading for at least 10 minutes. Either put the dough into a large loaf tin (900 gram loaf tin at least) or like me, shape it into a ball on a baking tray. Cover it with oiled clingfilm and a wet tea towel and allow it to prove for 30 minutes. Bake this in the oven for 30-40 minutes (it’ll double in size) and allow it to cool on the tray or in your tin for at least 15 minutes before turning it out to cool completely.